To make the shortbread layer, preheat the oven to 325° F. Line a 9 x 13-inch baking pan with parchment paper. In a small bowl combine the flour, baking powder and salt. Stir with a fork to blend, and set aside. In the bowl of an electric mixer, beat the butter and sugar on medium speed until well blended, about 1-2 minutes. With the mixer on low speed blend in the dry ingredients just until incorporated. Transfer the dough to the prepared baking pan and press in an even layer over the bottom of the pan. Bake 15-18 minutes or until golden. (If the crust puffs up a bit while baking, just gently press it down while it is cooling.) Transfer the pan to a wire rack and let cool completely. To make the chocolate glaze, combine the chocolate, corn syrup, and butter in a heatproof bowl set over a pan of simmering water. Heat, stirring occasionally, until the chocolate is completely melted and the mixture is smooth. 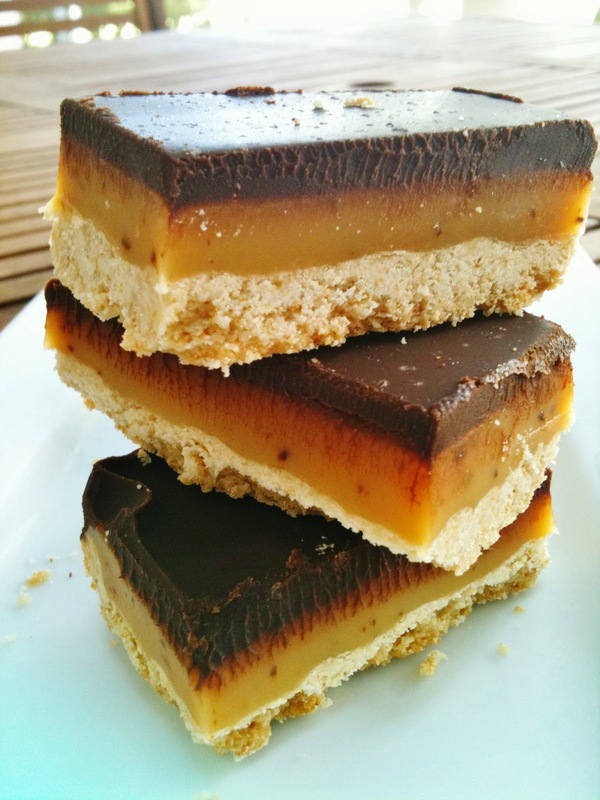 Pour evenly over the caramel layer and use an offset spatula to smooth the top. Allow to cool for a minute or two and then sprinkle with fleur de sel. Chill, covered, until ready to slice and serve.